Lawrence Hargrave (29 January 1850 - 14 July 1915) was an engineer, explorer, astronomer, inventor and aeronautical pioneer. Hargrave was born in Greenwich, England, the second son of John Fletcher Hargrave (later attorney-general of NSW) and was educated at Queen Elizabeth's Grammar School, Kirkby Lonsdale, Westmorland. He immigrated to Australia with his family, arriving in Sydney on 5 November 1865 on the La Hogue. He circumnavigated Australia on the Ellemere after being offered a place. Although he had shown ability in mathematics at his English school he failed the matriculation examination and in 1867 took on an engineering apprenticeship with the Australasian Steam Navigation Company in Sydney. He later on found the experience of great use in constructing his models. In 1872, as an engineer, he went on a voyage to New Guinea but the Maria was wrecked, and in 1875 he again sailed as an engineer on William John Macleay's expedition to the Gulf of Papua. From October 1875 to January 1876 he was exploring the hinterland of Port Moresby under Octavius Stone, and in April 1876 went on another expedition under Luigi D'Albertis for over 400 miles up the Fly River on the SS Ellengowan. He returned to Sydney, joined the Royal Society of New South Wales in 1877, and in 1878 became an assistant astronomical observer at Sydney Observatory. He held this position for about five years, retired in 1883 with a moderate competency, and gave the rest of his life to research work. Hargrave had been interested in experiments of all kinds from an early age, particularly those to do with machines that fly in the air. When his father died in 1885, and Hargrave came into his inheritance, he resigned from the observatory to concentrate on full-time research. and for a time gave particular attention to the flight of birds. He chose to live and experiment with his flying machines in Stanwell Park, a place which offers excellent wind and hang conditions and nowadays is the most famous hang gliding and paragliding place in Australia. "Workers must root out the idea that by keeping the results of their labors to themselves a fortune will be assured to them. Patent fees are so much wasted money. The flying machine of the future will not be born fully fledged and capable of a flight for 1000 miles or so. Like everything else it must be evolved gradually. The first difficulty is to get a thing that will fly at all. When this is made, a full description should be published as an aid to others. Excellence of design and workmanship will always defy competition." Study of curved aero foils, particularly designs with a thicker leading edge. 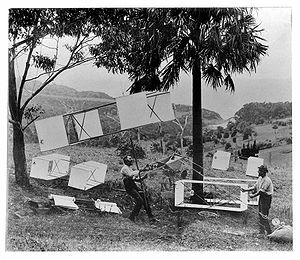 The box kite (1893), which greatly improved the lift to drag ratio of early gliders. Work on the rotary engine, which powered many early aircraft up until about 1920. He made endless experiments and numerous models, and communicated his conclusions in a series of papers to the Royal Society of New South Wales. Two papers which will be found in the 1885 volume of its Journal and Proceedings show that he was early on the road to success. Other important papers will be found in the 1893 and 1895 volumes which reported on his experiments with flying-machine motors and cellular kites. Of great significance to those pioneers working toward powered flight, Hargrave successfully lifted himself off the ground under a train of four of his box kites at Stanwell Park Beach on 12 November 1894. Aided by James Swain, the caretaker at his property, the kite line was moored via a spring balance to two sandbags (see image). Hargrave carried an anemometer and clinometer aloft to measure windspeed and the angle of the kite line. He rose 16 feet in a wind speed of 21 mph. This experiment was widely reported and established the box kite as a stable aerial platform (Hudson Shaw and Ruhen, 1977). 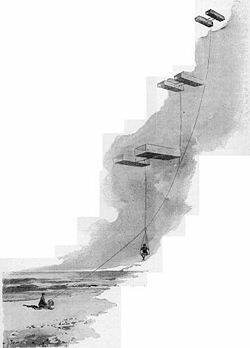 Hargrave claimed that "The particular steps gained are the demonstration that an extremely simple apparatus can be made, carried about, and flown by one man; and that a safe means of making an ascent with a flying machine, of trying the same without any risk of accident, and descending, is now at the service of any experimenter who wishes to use it." (Journal and Proceedings of the Royal Society of New South Wales, vol. 29, p. 47). This paper was read in June 1895 but part of it had appeared in Engineering, London, on 15 February 1895. This was seen by Abbott Lawrence Rotch of the meteorological observatory at Harvard University who constructed a kite from the particulars in Engineering. A modification was adopted by the weather bureau of the United States and the use of box-kites for meteorological observations became widespread. The principle was applied to gliders, and in October 1906 Santos Dumont in a box-kite aeroplane made the first officially recorded flight. As late as 1909 the box-kite aeroplane was the usual type in Europe. Hargrave had not confined himself to the problem of constructing a heavier than air machine that would fly, for he had given much time to the means of propulsion. In 1889 he invented a rotary engine which appears to have attracted so little notice that its principle had to be discovered over again by the brothers Seguin in 1908. This form of engine was much used in early aviation until it was superseded by later inventions. His development of the rotary engine was frustrated by the weight of materials and quality of machining available at the time, and he was unable to get sufficient lift from his engines to build an independent flying machine. Hargrave's work inspired Alexander Graham Bell to begin his own experiments with a series of tetrahedral kite designs. However, Hargrave's work, like that of many another pioneer, was not sufficiently appreciated during his lifetime. His models were offered to the premier of New South Wales as a gift to the state, and it is generally stated that the offer was not accepted. That is not correct. It is not clear what really happened, but there appears to have been delay in accepting the models, and in the meantime they were given to some visiting German professors who handed them to the Munich museum. (See the Technical Gazette of New South Wales, 1924, p. 46.) Hargrave also made experiments with a hydroplane, the application of the gyroscopic principle to a "one-wheeled car", and with "wave propelled vessels". Hargrave's only son Geoffrey was killed at Battle of Gallipoli (The Great War 1914 - 1918) in May 1915. Hargrave was operated on for appendicitis but suffered peritonitis afterwards and died in July 1915. He was interred in Waverley Cemetery on the cliffs overlooking the open ocean. Picture - From 1966 to 1994 the Australian 20 dollar note featured Hargrave on the reverse. An engraving of Lawrence Hargrave alongside a number of his gliders appeared on the reverse of the Australian $20 banknote from 1966 to 1994. There is a memorial to him at Bald Hill overlooking Stanwell Park beach. Lawrence Hargrave Drive is an iconic road which stretches from the Old Princes Highway in Helensburgh to the bottom of Bulli Pass in Thirroul. A centenary celebration and reenactment was held to commemorate the manlift in November 1994 at Stanwell Park. The Lawrence Hargrave Professor of Aeronautical Engineering at Sydney University and the Hargrave-Andrew Engineering and Sciences library at Monash University are named in his honour. Australian commercial air-carrier QANTAS named its fifth wide body A-380 aircraft VH-OQE after Lawrence Hargrave. Serle, Percival (1949). "Hargrave, Lawrence". Dictionary of Australian Biography. Sydney: Angus and Robertson. http://gutenberg.net.au/dictbiog/0-dict-biogHa-He.html#hagrave1. Retrieved 2006-12-18. Amirah Inglis, 'Hargrave, Lawrence (1850 - 1915)', Australian Dictionary of Biography, Volume 9, MUP, 1983, pp 196-198.